Studio Monitors are very important! The speakers (or monitors) you use for mixing your recordings should be good quality. Try not to cheap out on these. 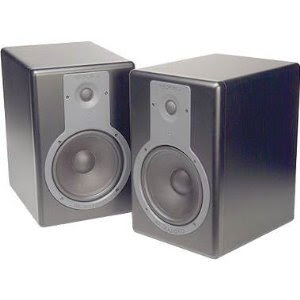 A decent yet affordable pair are the M-Audio BX8a studio monitors. These speakers do not disappoint. They have unbelievable clarity and accuracy. Of course there are better speakers out there on the market but if you do not have a ton of money, these will work! At about $500 for the pair, you cannot beat it. They are a little bit bass heavy so you have to take that into consideration when mixing your music. Just use your ears and do some practice mixes when you get them. Then take your mixdown and play it in your car, home stereo, and laptop to see how your mix sounds in different types of players. Then adjust your mix accordingly.